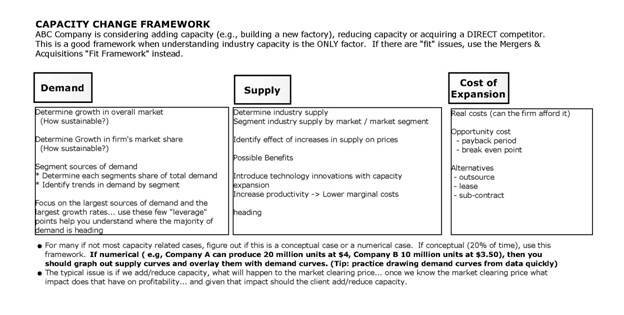 I've had several requests to provide an example of a case involving the Capacity Change Framework as described in my case interview frameworks article. Before I provide the example and walk through how to solve it, let me start by providing some context. First, you don't see this kind of case very often. I did 60+ case interview questions and never saw this case even once. The scenario where I think you might see it is in a written test or a written case of some sort. It is data heavy and visualization heavy, meaning to really convey this case to a candidate in a fair way you really have to give them a data table or really a data chart. Second, this type of cases requires some basic understanding of micro-economics. As firms have moved toward hiring more non-MBA types -- JD's, PhDs, MD's, my sense is they have gravitated away from using this kind of case because it requires too much pre-existing knowledge rather than more general problem solving skills. So it is possible for someone extremely analytical who would make a great consultant to not do well on this case because they didn't have sufficient background knowledge to understand the case. From an interviewer's point of view, this make this kind of case a bad one. Incidentally, if anybody reading this has gotten this case, please let me know. I haven't gotten a single email so far about someone who has actually seen this kind of case in real life -- but am eager to get some data on this. Okay, that being said, let me start with the minimum level of micro economics needed to understand this kind of case. DEMAND - Demand is what customers are willing to BUY at a certain price. So if you are willing to buy one iPad for $500, but if it were priced at only $100, you'd buy two -- that's an expression of your demand for a particular product. Demand is always expressed as a relationship between two factors -- PRICE and QUANTITY. In consumer markets, demand is usually expressed not for a single individual but for an entire marketplace. Most case interviews you will see do not involve consumer markets. In industrial markets, demand (particularly in cases) is listed by individual buyer. So Buyer #1 is willing to buy X units at $Y price. In most heavy capital investment industries with extremely high FIXED costs, manufacturers will basically sell goods at any price point that exceeds its VARIABLE costs. Or stated differently, if I have a $1 billion factory, and it costs me $1 in raw materials and labor to produce one unit of my product, if I can sell the product at $1.01/ea, I will do it.. because I cover my variable or per unit costs, and still make some contribution to help pay for my fixed costs or overhead. This is the key concept that is not always obvious to people unfamiliar with micro economics. A manufacturer will sell at any price above VARIABLE cost (also known as MARGINAL costs -- as in on the margin or for the very last unit produced what is the incremental cost for producing that last unit). Keep in mind this is different than saying a manufacturer will sell at any price above TOTAL costs (which includes paying for part of the overhead, rent, interest expenses which are all "Fixed" costs). The perfect example of this is the airline industry. They have this very expensive plane, and as long as the price for the last passenger on the plane covers the additional cost of jet fuel, the can of Coke, and the bag of pretzels they give you, it is to the airlines advantage to sell out every seat they can. In these case, you are often asked to figure out what happens to PRICES after a major change in DEMAND or in SUPPLY. So for example, if United Airlines goes out of business, what happens to prices for airline tickets -- American Airlines wants to know! And intuitively most people recognize that if supply exits the market, in this case United, we expect as consumers that prices will go up. Now in a case capacity change case, basically the question is to figure out where the new market price will be after a major in change usually on the supply side. The process is actually much easier than it seems -- because to many it seems very intimidating. Basically all you need to figure out from your data table, data, or chart provided is to figure out the PRICE and QTY combination that works for both customers and suppliers. For a single SUPPLIER to decide to run the "factory" and produce goods, the market price must be higher than the VARIABLE cost. Of course, variable costs do vary from supplier to supplier. For a single BUYER to buy, the price must be below the buyer's "Maximum Price" that the buyer is willing to pay. Of course, the maximum price a buyer is willing to pay will vary from buyer to buyer. When the data is illustrated on a chart where price is the Y axis, and quantity is the X axis, it's basically where the two lines -- one representing demand, one representing supply -- intersect. The problem is that when this information is provided to you visually, it rarely looks like a nice neat line. For those who are more math oriented, the "line" is often not linear and often not smooth -- and thus, based on my limited math abilities, not conducive to being easily described by an equation. So in theory you should be able to solve this problem with equations, but in practice virtually 100% of the time an equation is not provided and the data does not lend itself to your creating one. So in practice, you have to figure out the answer logically rather than say algebraically. So the way the problem is often presented is you see table listing all the major buyers in a market place that includes the quantity they are willing to buy provided the price is equal to or below their "max price". You will notice that if the market price is $5/unit, all 3 buyers will buy an combined quantity of 300 units. If the market price is $7, only Buyer A is willing to buy at all, so the combined quantity of all buyers at that price is 100 units. Then you will see a table (or given the same data in a different format) for Suppliers indicating the qty they are able to produce whenever the price is ABOVE or EQUAL their variable cost. (Note be sure to double check whether the definition is the supplier will produce when the price is ABOVE their variable cost OR when price is ABOVE OR EQUAL TO their variable costs). So if the market price is $7/unit, since this exceeds the variable costs of all suppliers, all 3 suppliers will produce for the buyers. So in total, 300 units will be produced. Similarly if the market price is $4.99/unit, this is only profitable for Supplier A, so only Supplier A will produce 100 units for the market. Oh yeah, one more conceptual thing. Assume suppliers SET the prices, and buyers decide whether to buy or not. Also assume that sellers will collectively keep raising the price until they are unable to sell out their capacity, in which case they will lower their price a $0.01 at a time until they do sell out. Also keep in mind not every buyer will necessarily participate in a market. Similarly not every seller will necessarily be able to produce in a market. So now the question is given the buyers and suppliers preferences, what will the prevailing market price be AND what quantity will change hands between buyers and sellers? The process I usually use is to start with the quantity and max price of the buyer willing to pay the most. I then ask myself, if market prices were at that buyer's max price, how many units would suppliers produce? Does qty buyers are will to buy match what sellers are willing to sell? If suppliers will over produce at that price, I then move to the 2nd most aggressive buyer (the one willing to pay the 2nd highest price). I then ask myself at this price point, what will the suppliers in aggregate produce and is it enough to meet the demand of ALL buyers who are willing to the pay the max price of the 2nd most aggressive buyer. If the qty demand = qty supplied, then you stop and that is the market price. If qty demand > qty supplied at that price, assume suppliers will keep raising prices in $0.01 increments until qty demand = qty supplied. If qty demand < qty supplied at that price, assume the suppliers with lower cost structures will reduce prices by $0.01 at a time until qty demand = qty supplied. So here's the question in this case for you, in the example above what is the market price that will prevail and what qty will change hands? Take a shot a figuring it out (e.g., AVOID reading ahead until you work through the example as these examples are extremely difficult to come by online). Market price will be $5.99 and the quantity exchanging hands in the market is 200 units. At $7, Buyer A is willing to buy 100 units, and Suppliers A. B, C are willing to supply 300 units. There's too much supply, so prices will fall. Lets jump down to $6. At $6 Buyers A, B are willing to buy a combined 200 units, and Suppliers A, B, C are still willing to supply 300 units. The price is still too high. Lets jump down to $5. At $5, Buyers A, B, C are willing to buy a combined 300 units, but at this price only Suppliers A. and B are willing to produce a combined 200 units. The price is too LOW! If this does not make sense, please re-read it carefully. Because the "answer" $5.99 is really where the actual case interview starts (you didn't think it would be this "easy," did you?). Now the REAL part of the case typically begins. In "real" cases the example above will basically describe the current situation. And the case will then typically change demand or supply in some way, and ask you to recalculate everything above. 1) Assume Buyer B, goes out of business. Assume your client is Supplier C and they ask you is this a good thing or a bad thing and why? The basic approach is really identical to what we covered above. You create a new table for the buyers that remain in the market (in this case Buyer A, C) and you redo the analysis to see what the market price and qty will be. Then you figure out if this favorable to your client, Supplier C, and advise accordingly. 2) Assume your client is Supplier A. They have an opportunity to acquire Supplier B. If they did, they have the opportunity to run it "as is" or shut it down. Should they buy? And if so, do they run it "as is" or "shut it down"? In this variation, you the "as is" scenario doesn't really change the suppliers table. So the decision on whether to buy and run it "as is" would probably be driven by the purchase price and time frame to recover the client's investment. In the "shut it down" scenario, you would need to create a new supplier table, in this case with Suppliers A, C. Redo the analysis and see where the price and qty would be. (Or if you're able to "see" what would happen by eye-balling the data, you could draw the same conclusion). This makes it harder to eyeball the table and figure out the right conclusion. You tend to have to actually do the math. Typically you will see more than 3 buyers or suppliers... 4 - 6 would be a more realistic range to expect. Other twists to the case could be calculating profits for a particular supplier before and after a change in demand or capacity. Your client is Supplier B. They notice that Buyer B just went out of business. They want you to determine how this change will affect their net income. The basic approach is you take the market price - Supplier B cost per unit. This is Supplier B's profit per unit. Then you multiply by however many units Supplier B would produce. So if the market price is $5.99 and Supplier B's cost is $5, then the profit per unit is $0.99/unit. Then we take the profit per unit X 100 qty produced, and the profit is $99. Then for the 2nd scenario (after Buyer B goes out of business), you basically recalculate the market price, market quantity, and redo the profit calculation for Supplier B under these new conditions. 1) Sometimes it is MORE profitable for a supplier to buy a competitor and shut it down. In this situation, what you're looking for is a supplier whose presence in the market is causing prices to be significantly lower than if they were not in the marketplace. This is especially true if the acquirer has a lot of volume or market share, but is forced to sell at an absurdly low price (still profitable, but not by much). In these cases, the market share leader could buy out this annoying competitor that is driving prices down, immediately increase prices, and dramatically increase net income enough to compensate for the acquisition costs. 2) Sometimes, the "answer" for the case is that your client is in a "no win" situation given current market conditions and maybe they should exit the market. So maybe your client is Supplier B, and Supplier A has made an offer to buy your client. You are asked whether or not they should sell? And if they should sell at what price assuming the buyer wants a 2 year payback period on their investment? The approach is just another variation of the core analysis we covered above. You figure out the change in profit for the BUYER before and after the acquisition. See what the incremental profit is per year, multiple by 2 to come up with the 2 year cumulative improvement in profit, and that's the recommended selling price. Hope this helps. Again, you don't see this kind of case very often, so once you get the gist of the case and how to approach it, your time is probably better spent elsewhere. Other case interview examples and real case interview questions can also be found on this site for you to review. I calculated the price before B went out of business. It’s $5, right? (demand=1100 and supply=1200, but when lowering the price to 4.99, supply=400 and demand stays 1100 so price will get up to $5 again.) So they won’t make profit (price = variable cost/unit), but they will sell 800 units. After B goes out of business, the price will drop to $4.99. This means that supplier B (=client) won’t produce any longer, and lose their market share. But why is B even in this market when producing at a variable cost that equals the price? They don’t make profits… And they are in fact losing taking the fixed costs into account. No demand for supplier B: the price will drop to $4.99. Supplier B loses its market. But I’m not sure, how does it works in a such situation? any example of conceptual ones? i guess this one is the numerical one and I would love to see some conceptual question on this so I can actually use your “capacity change framewor” to solve it. I had an interview for strategy consultant role and got a case like…’there is an oil company in africa which supplies to only 1 buyer i.e. govt. and the contract was of 50 or 100 yrs and is going to end. Recommend solution. First ques by interviewer: What is the risk involved? gave numbers to calculate financial risk? I was able to calculate. Second Ques: What is the key issue? Ans: Contract is going to end and the company will not have a buyer. Wrong answer — Interviewer said that key issue is that xxxx quantity of oil is going to be extra and a financial risk of xxxx$. Feedback provided: Could not identify key issue. Answer: Extend contract with govt. by price discount on short term, Acquisition of distibution channel by integrating with ….dnt remember. Feedback: DID not talk about ‘spot accumulation of oil’. Nice job and good luck with the rest of the process. Hang in there. Anything worth achieving usually has set backs. Good luck going forward and make sure to take whatever you learned from the interview that didn’t work out and apply it to your preparation. Feedback is useful , but only if you are willing to embrace and learn from it. They divide the excess profits equally, so the net income for each is $596 and $596. Cooperating to set prices = collusion = illegal recommendation = no job offers?? 3. After determining which alternative to pursue, provide the potential risks associated with the option and recommendations. (1) Is this a capacity case? (2) What is the best way to approach this case? Any help will be greatly appreciated as I will be going into the final interview in 2 days time. Many thanks! In the Capacity Change Framework, on the supply side. You mention to determine the industry supply segmentation. What do you mean by this? Are you referring to raw materials? Plant utilization?